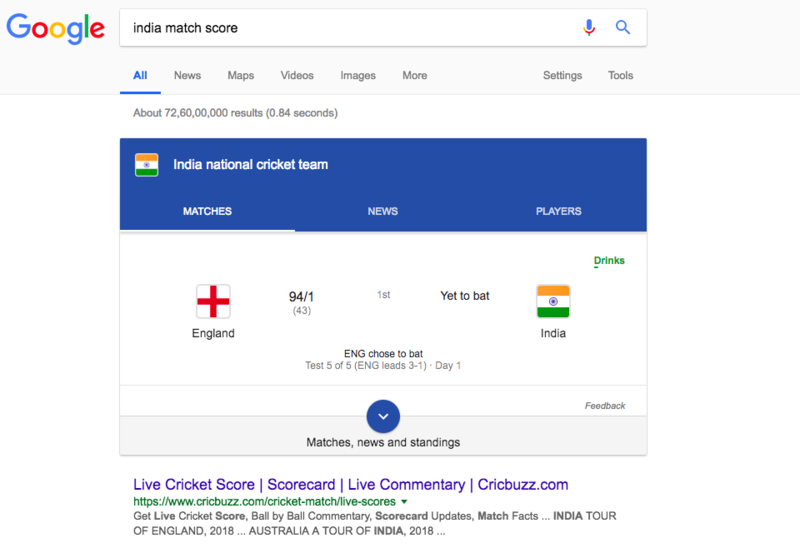 I was talking with a friend who works at a news publisher and he cried foul on how Google had started showing cricket match scores on the search result page (SERP) itself and how that’d translate into lower traffic on news sites like his. 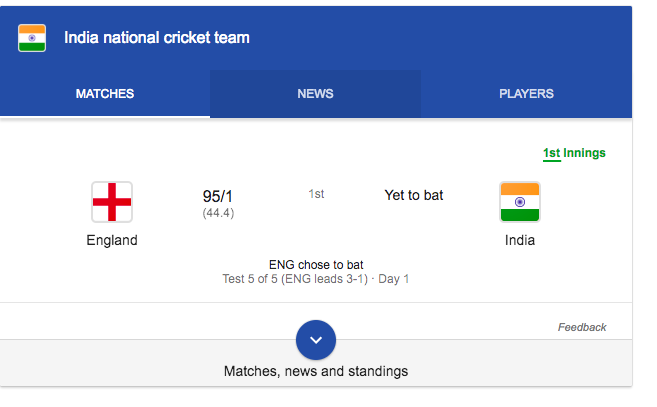 First Fold of Google’s SERP for a query on Cricket Match score. The information shared here is sufficient for someone who wants to follow the match score updates. In case the user wants to know more details they have two options ‘Click the downward arrow’ or ‘Click the first search result’. Which one do you think are users likely to click more? For a user following match score one gets most info on Google’s SERP itself. 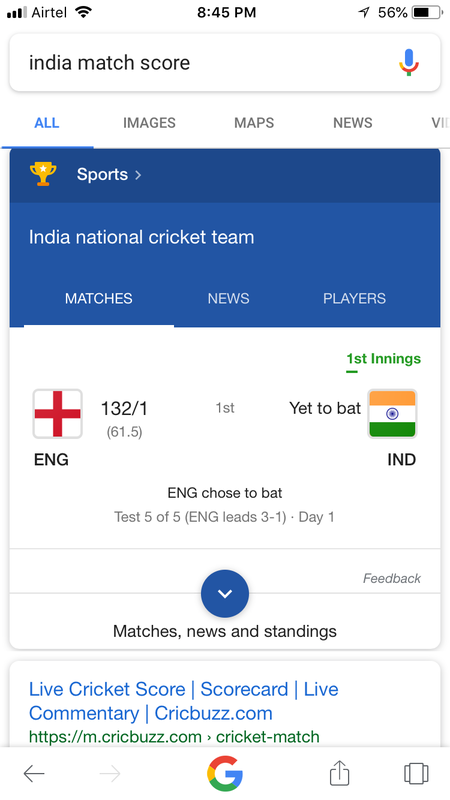 Only in case when the user wants more details (like who is batting, bowling etc) they’d need to click one of search results. Also, if one needs to just see the basic scorecard (updated real time), that has also been taken care by Google. What: Google just shaved off top of the funnel traffic searching for match scores from news/sports sites. Why: The match score is a “Commodity” which is updated on numerous websites and almost all of them have extremely poor user experience especially for someone who just wants to just know the match score. Thus, Google decides to serve the customer a better experience by bringing score on Google’s SERP itself. News is important for a lot of people, though how they consume news has changed thanks to the internet and subsequently mobile revolution. While earlier one had to wait for the morning newspaper, radio or TV update to find out news, with Internet, news has become a 24/7 event available to everyone realtime. Like me, a lot of people consume news through Social Media platforms like Twitter, Facebook, LinkedIn or Messengers such as Whatsapp. Another way to find out news (over going directly to say news website) is to Google it. means that Google would want to serve its users with as much news content as possible (all commodity content) without them ever having to leave their property. Enter Mobile and the game changes significantly. Unlike on web, folks on Mobile don’t instinctively open Google.com or start typing their search query on address bar when they need to find something. 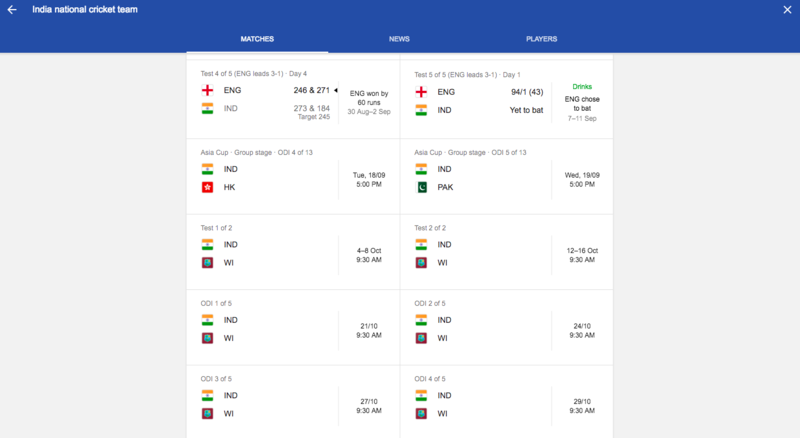 Also, opening the browser to log on Google or opening Google Search app to find out news and bits like match score isn’t the most efficient way. So what do people end up doing instead? NEWS APPS: People who follow news tend to use mobile apps by their favourite (assuming they have one) news publisher which they can nibble news on while in the restroom or waiting for their coffee, uber etc. The fact that most people are spending more time on their mobile (over desktop) and the fact that Google doesn’t enjoy the same share of user habit as it does on web is serious threat to Google. In May’18 on their famed I/O event, Google announced launch of the revamped and AI powered news app. Now the thing about Google is, if they say something is powered by AI, it is best for everyone to believe them (as they know what they are talking about). The News app was launched on Android and iOS devices in 127 countries. What’s so great about the Google News app deserves a separate blog post. That aside, IMO it’s a death siren for other big/horizontal media houses or news publishers. While publishers were trying to plan on how to win small battles on the web, Google dropped the nuclear bomb on mobile. This is a very tough spot to be in for News Publishers. Whether and how to partner with Google when it competes with them for user attention/usage and this is a great predicament for them. 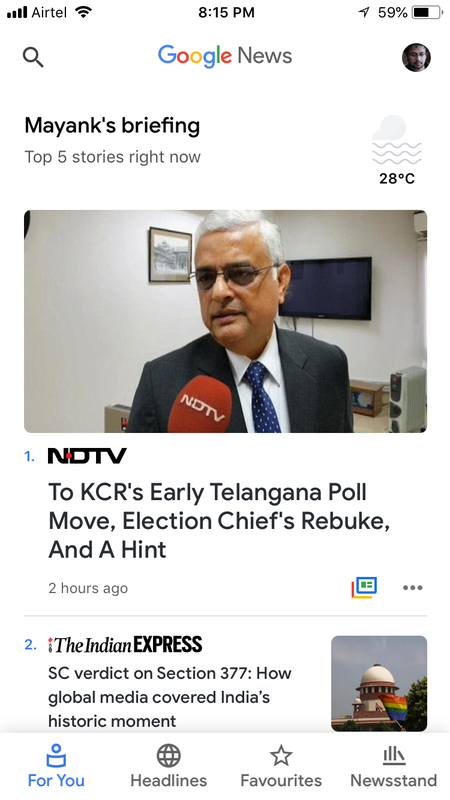 This entry was posted in Media, News and tagged apps, google news, mobile, News, publishers on September 7, 2018 by mayank.